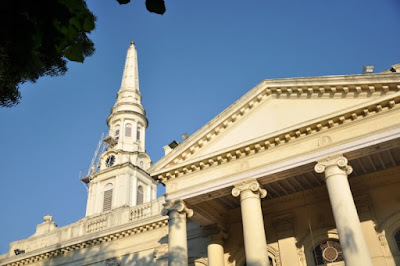 There are many colonial churches in Chennai (madras), once an important seat of power for the East India company and they capture the ethos of old colonial period. In the annals of the history of Christianity in India very few occupy a position of eminence and in this respect St. George’s Cathedral (Church of South India), Chennai may be counted as one among them. 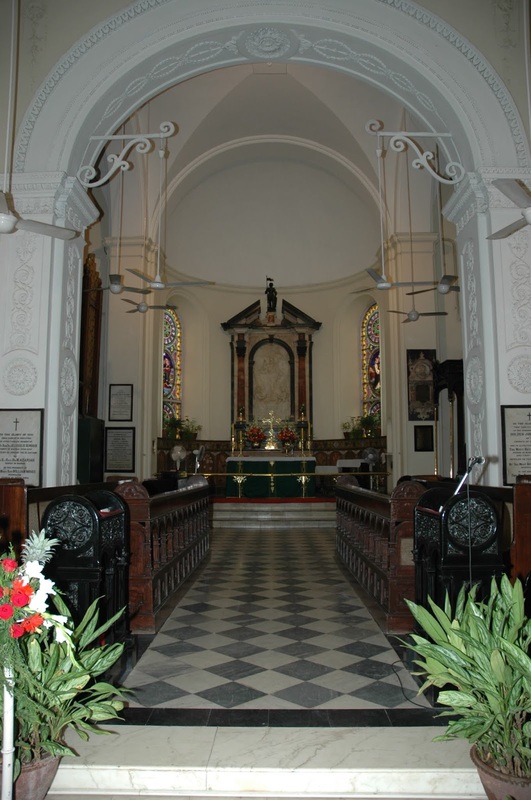 Built in 1815, previously it belonged to "Church of England" and "Anglican". The church was completed with public funds collected through lottery and a sum of 41,709 pagodas (1 Pagoda = IRs 3.50) was spent on the constuction work. This does not include architect's commission, furniture and a pipe organ. 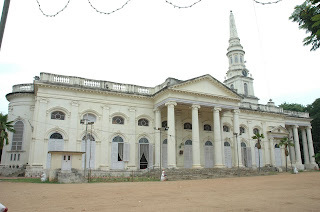 Opened in 1815, it served countless VIPs including the Governors of Fort St. George and their families and also the Viceroys whenever they visited Madras. 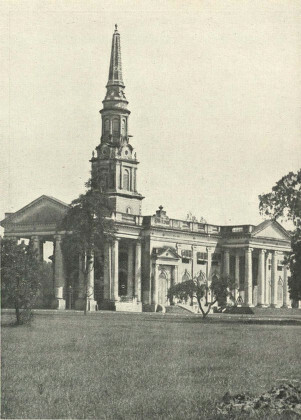 The architect was Col. J. L. Caldwel, East India's Sr. Engineer who was ably supported by his assistant Captain De Havilland. 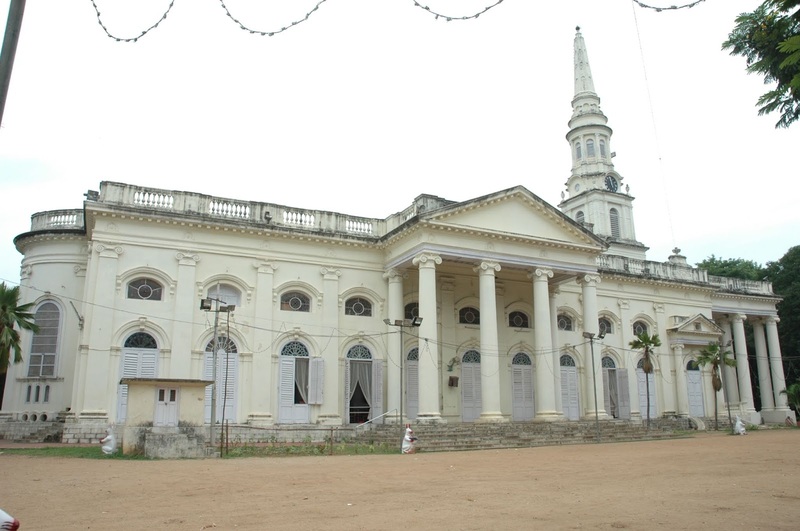 It is needless to mention that this old church is steeped in colonial history. To cope up the growth of Christian community after 1815, a graveyard was built in the SE corner of the site. Engineer De Havilland's wife's funeral was the first to be held here. Yet another historical feature is the the guard rail of the graveyard consists of of war insignia like muskets and bayonets seized by British forces led by Wellesley at the Battle of Seringapatam in 1799 in which Tipu Sultan was killed. The church has 139 feet tall steeple that is visible in the neighborhood. Several individuals made contribution to the church by way of donating some items. On each of three faces of the turret in the steeple, there is a clock and they were presented by the Directors of the British East India Company to the Trustees in 1828. The church has a nice belfry that was completed in 1832. There are eight bells that were made by Messrs Mears & Steinbank, Founders, London in the year 1871. They were presented to St. George’s Cathedral by Mr. G. Banbury during Christmas 1873. The chiming device was donated by Rev. Thomas Foulkes. All the eight bells vary in size. 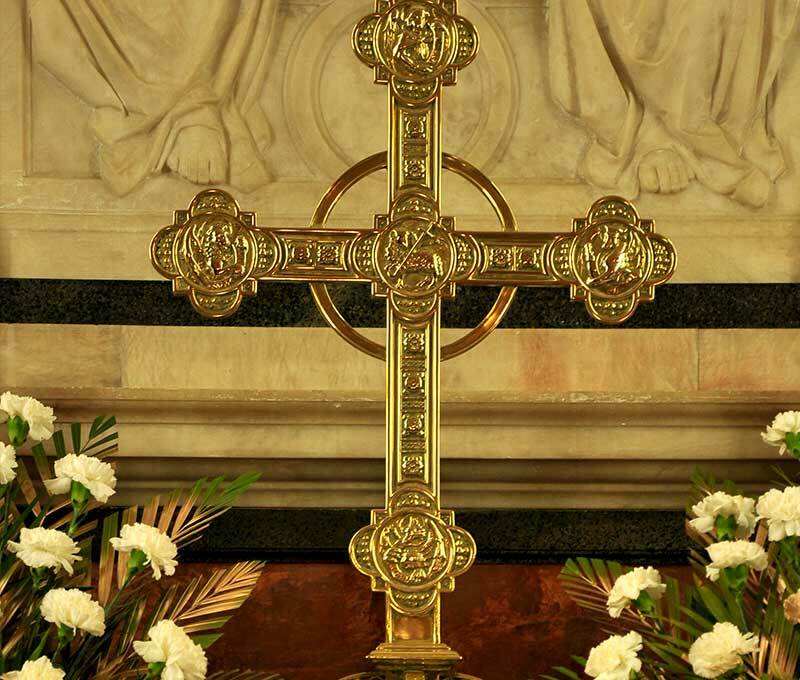 Surgeon-General Cornish donated the beautiful brass altar cross in the church. The nice-looking lectern was a memorial tribute by his friends to Archdeacon Warlow. The Episcopal chair was a gift from F. E. Kneale and the gift - list goes on. The gold chalice and Paten for Holy Communion were donated by Lt. Col. Herbert St. Clare Carruthers in 1908 and they weigh 3 lb 7 ounces (1.6 kg) in 18 carat (75%) gold. The chalice is set with diamonds in the form of a cross. 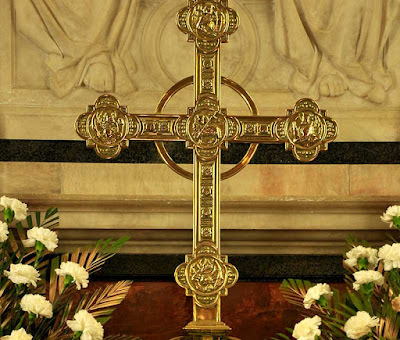 The altar rail was erected by P. Orr and Sons to the memory of Edward William Orr, a member of the choir, who died in 1913. The marble baptismal font was gifted by the congregation. 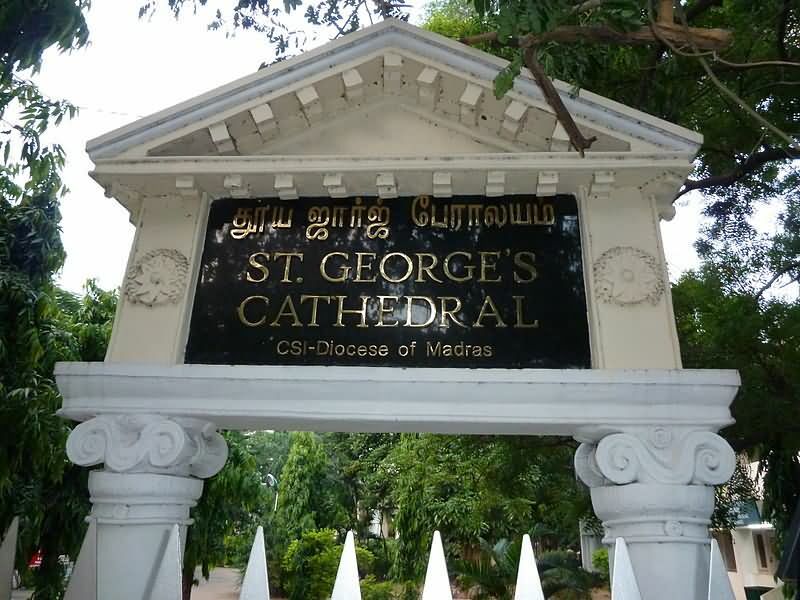 St. George’s Church, the patron saint of England after whom the church is named, became a cathedral of Madras in 1835 and there is a a black marble statue of St George . The vestry and the lady chapel were also added later. In 1884, plaster roof of the nave was replaced by one of teak and patterned it with papier-mâché. 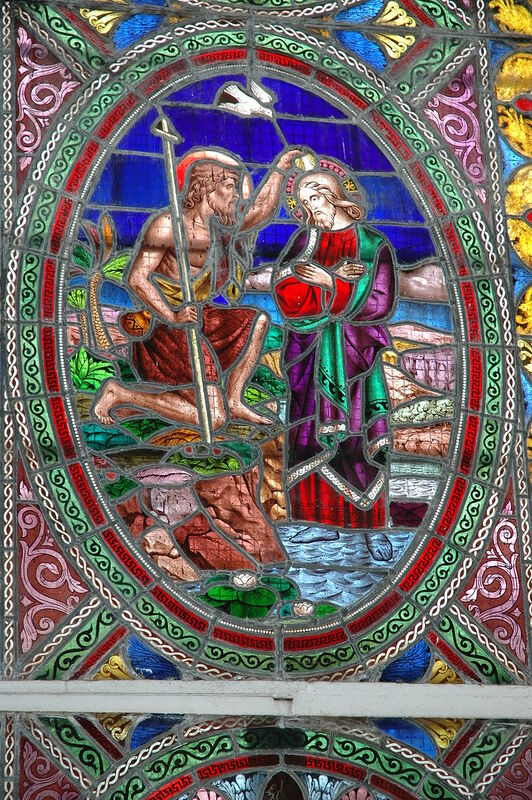 The stained glass windows of St. George's Cathedral are quite inspiring. The left panel with a vivid depiction of the Baptism of Jesus by John the Baptist in the River Jordan and the Holy Spirit descending in the form of a dove and the right panel depicting the resurrected Lord with Mary Magdalene are worthy of mention. 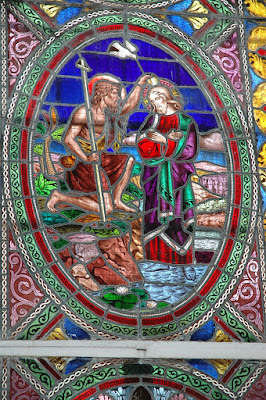 The vibrant colors accentuate the stained glass works. On either side of the altar in vibrant colors are two panels describing two important events in the life of Jesus. There are stained glass panels on top of all the doors of the Cathedral. Sunlight passes through these colorful medieval art works, transforming the interior of the entire Cathedral into a warm colorful matrix. 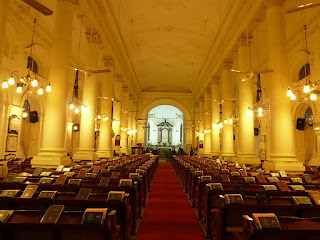 The cathedral is an architectural wonder with tall steeples, huge pillars, marble statues and fine wooden furniture. The church has a plethora of memorial tablets, monuments and statues implying its close link with the colonial time and history. 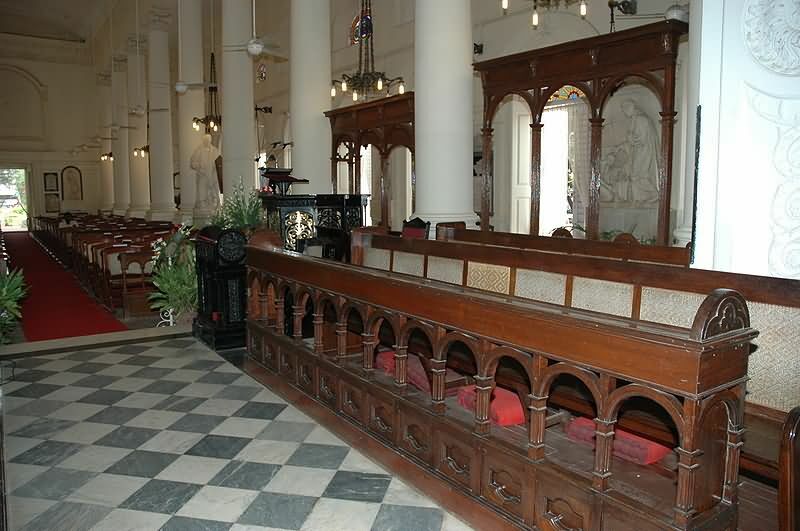 Many officers and who took part in various important wars - First Anglo-Afghan War, the Battle of Ferozeshah in 1845, the Battle of Sobraon, the Battle of the Somme in 1916, battle at Waterloo, etc., had prominent affiliation with this cathedral and tablets are erected in their memory. As for monuments, mention may be made of the statue of the Rt. Rev. Daniel Corrie, the first Bishop of Madras (1835–1837) at the left entrance to the cathedral, the bust of the Rt. Rev. 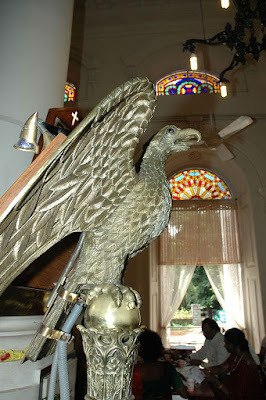 Frederick Gell, Bishop of Madras (1861–1899) at the entrance of the Lady chapel, and a memorial tablet for the first Indian Bishop of Madras, the Rt. Rev. David Chellappa (1955–1964) erected by the congregation of St. George's Cathedral. There is a tablet for the Rt. Rev. 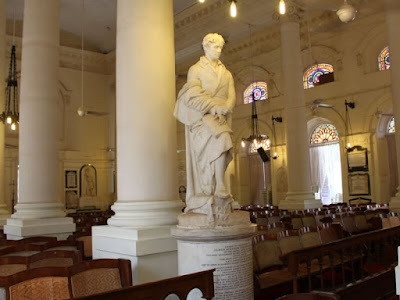 Robert Caldwell, a scholar in Tamil and who for 53 years devoted himself to translation of Bible and other works in Tamil. His area of operation was Tirunelveli and he also served as assistant to the Bishop of Madras and died at Kodaikanal in 1891. 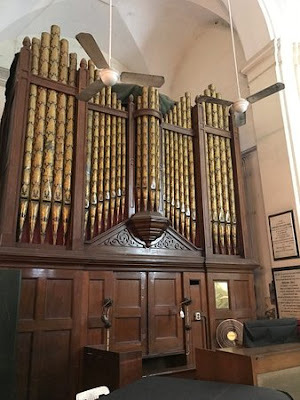 Like-wise there is a plague for Edward Sell, Canon of St. George’s Cathedral who had worked for 67 years in Madras and died in 1932 at the age of 93. 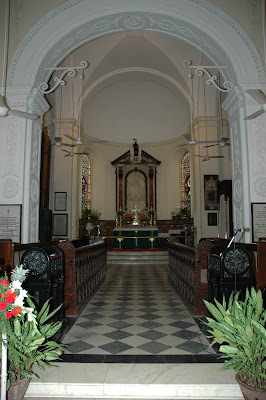 Besides, there are memorial tablets of Dr. Anderson, the famous doctor who introduced silk manufacturing in Chennai and William Parry and John Binny, merchant entrepreneurs whose names are still remembered in the city’s oldest business establishments and Bishop Heber (of Calcutta) who died at a young age while on a visit to a church in Tiruchirapalli city.